A house that has been destroyed by a fire. Fire Damage to your home is more than a disaster… It’s a tragedy. Your familes lives have been dramatically impacted and the challenge for you moving forward is immense. 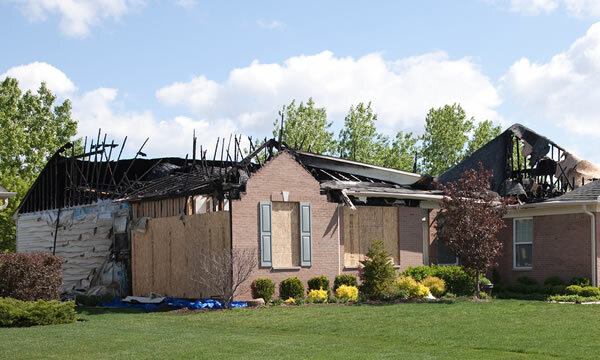 At Hubble Construction and Restoration we hear countless stories from familes who’ve suffered through the tragedy of a house fire, that part of our job is never easy. We take great pride and satisfaction in knowing that through our restoration services and expertise we’re helping families rebuild their lives. While we cannot replace your possessions or other valuable items you may have lost in the fire, we can certainly help you rebuild. From the ashes of what once was, you’re new home will be put rebuilt through our streamlined recovery and rebuilding process. Wait Until It’s Deemed Safe For Us To Enter. Immediately Stabilize and Secure the Site. Come Up With A Recovery Plan. Generally if a fire is in a contained area and doesn’t damage the existing structure (beyond repair) then we can simply remove all the damaged material and rebuild it for you, that’s a best case scenario. The worst case scenario is obviously a total loss of your structure and we’ll have to rebuild from the ground up. It’s certainly a larger project, but nothing Hubble Construction and Restoration can’t handle. With house fires that are contained by the fire dept. before a total loss of the structure there is always resulting water and smoke damage within the home and it’s contents. If something is salvageable we’ll try our best to save it for you via specialized cleaning processes and equipment that we have at our disposal. But sadly, we will have to remove most of it from the site. In the case of a repaired structure we can completely eliminate any trace of residual smoke smell. It will be like it never even happened.